There are so many different types of coffee out there – beans from different parts of the world, light and dark roasts, etc. – that it doesn’t seem like it should be that hard to find a coffee that you like. And it’s not, but finding that “perfect blend” is pretty dough. Unless you have your own roastery and have access to many different types of beans, the odds of getting a custom coffee blend that really suits your taste to a T is slim. One roastery, The Roasterie, is offering the opportunity the create your own custom blends through their shop. 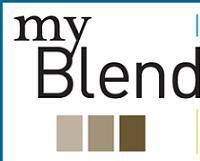 MyBlend walks you through the process of creating a custom blend, offering suggestions about the roast and the different flavor notes that are out there (fruity, floral, etc.). The descriptions are given in such a way that even a coffee novice will find it easy to customize their blend. My choices led me to a coffee that is “Vibrant and round with subtle nutty undertones.” Once the coffee blend is chosen, you can make a custom label for your product and have your own “house” blend – at home, of course!